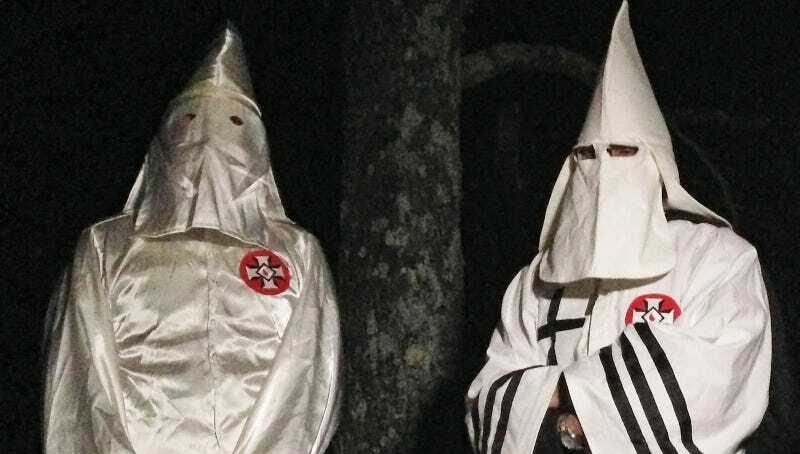 Two members of the Ku Klux Klan photographed in Pelham, North Carolina on December 2, 2016. Image via AP Photo. Reuters reports that the Trump administration is planning to reframe CVE, or the “Countering Violent Extremism” program, to solely focus on Islamist extremism. According to sources briefed on the matter, this means that the program would no longer target, say, white supremacists, another victory in a long series of wins for Neo Nazis, the KKK, and other violent and terroristic groups whose aims more or less boil down to ethnic cleansing. Reuters notes that CVE has been criticized by some as ineffective, and community groups already had concerns that the program could be used for surveillance. Hoda Hawa, director of policy for the Muslim Public Affairs Council, told Reuters that she learned of the push to refocus CVE last week. “That is concerning for us because they are targeting a faith group and casting it under a net of suspicion,” she said. During the campaign, Trump threatened to ban all Muslims from the U.S. and proposed creating a Muslim registry; since the election, bias-related harassment and intimidation spiked; since he became president, he sparked mayhem by attempting to implement a version of that Muslim ban and oversaw a bloody, botched operation in Yemen whose civilian casualties are being widely publicized by Al Qaeda. Sounds like, hmmm, this newfound “focus” just might be making everything way, way worse! Dylan Roof, a white supremacist terrorist who became radicalized online, was recently sentenced to death for the murder of 9 black churchgoers in Charleston; meanwhile, despite efforts by Fox News and Donald Trump, Jr. to depict him as otherwise, a white male Trump and Marine Le Pen fan was charged with the deaths of six people at a Quebec mosque. Since the Oklahoma City bombing, which killed 168 people in 1995, white extremists have murdered somewhere in the range of 63 people; according to FBI documents obtained by The Intercept, the FBI has been quietly investigating the active presence of white supremacists in U.S. law enforcement agencies. But, yeah, nothing to see here.